Alright, watch friends and family – pull up your chairs. I’m going to tell you a story. This is one about a new watch brand starting up (heard it), they’re going through Kickstarter (heard it), and they are offering some tremendous value (heard it). So, yeah, this is a story we’ve heard before, right? Well, after spending some time with a prototype Traska Freediver, I think you’ll find that this story does not end like all of the other ones you’ve heard. In fact, that’s why I went with the lume shot for the leading images, just to show how this is familiar, but still a bit different. When I opened up the watch I immediately started seeing some other references. For instance, that set of indices at 12 o’clock? Felt a lot like my Orange Monster. Twisted lugs? Feels kind of like an Omega. And so on and so forth. I’m not saying the brand claims these influences, it’s just what I’m seeing in it – and they’re all good associations. Now, back on those indices on the Traska Freediver. These are chunky, and sit high up above the matte black dial. On this prototype, the color was a bit off, but production models will be fully BGW9 bright white, and match up with the painted bits and the handset exactly. And since this is a prototype, there were a few things that I noticed (there’s a copper color you can notice on the underside of the bezel, and there’s a touch of gap between the bracelet and the lugs), but they’re minor, and one is confident they could be addressed in the production versions (there’s also a stainless finish and teal dial that is quite striking). And make no mistake, this is a striking watch. The Traska Freediver is fun to look at, and for being a dive watch, it’s not drawing attention due to it’s size. No, the spec has it at 40mm, but I’d call it a “small” 40. In other words, this is a fairly compact diver, which means it should fit onto a wide variety of wrists. Tucked underneath that lovely, contrasty dial is a reliable Seiko NH38 movement. This may not be as well known or used in the watches we’ve seen as of late, but I didn’t notice any problems (smooth winding and setting, and accurate), and should prove to be rather reliable. Also reliable? That 120-click bezel. There is virtually no play in in at all, with a solid (but not overly resistant) clicky feel as you move it around. Also fun is the sapphire insert (to match that sapphire crystal) that is fully lumed. This may be a bit controversial for some (as it does make for a very shiny top surface), but for those, there’s also going to be a stainless steel insert. In the time I had with the Traska Freediver, I found a lot to like. It fits to my wrist well, it feels solidly built, and there’s just a lot of nicely done details here, including all of those influences I mentioned up at the start. Mix in that the early-bird pricing is going to start at $375 for the sapphire insert, and $350 for the stainless insert, well, you’ve got a pretty massive value going on here. 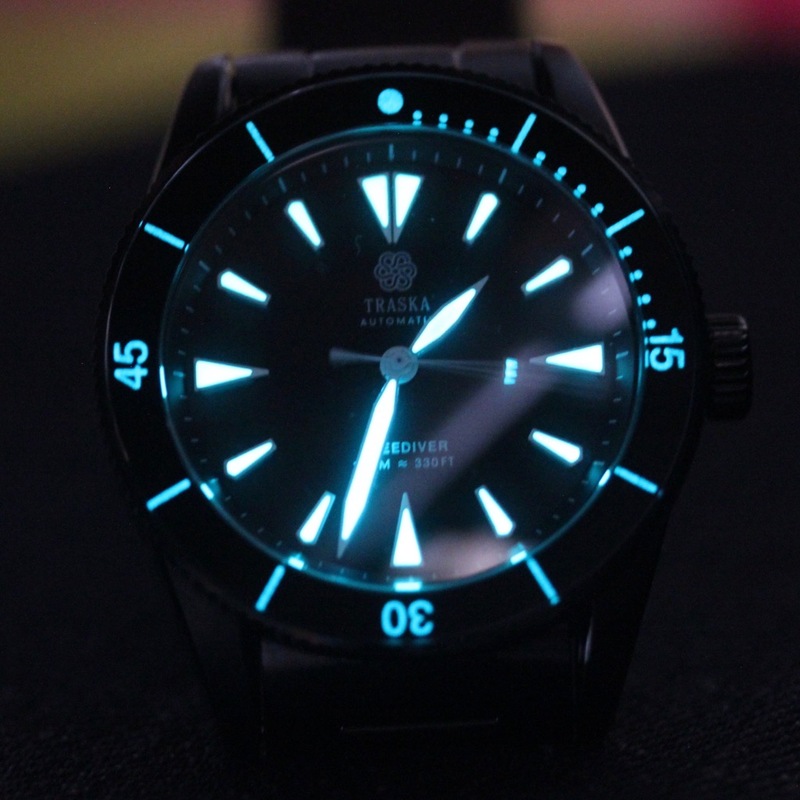 In my book, this makes for a very solid everyday sort of watch (though I might opt for the stainless/teal combo if I were picking one up, personally), and all the steel and 100m WR rating should be the watch is ready for what you throw at it. Next articleAlpina AlpinerX Smartwatch…on Kickstarter!? !